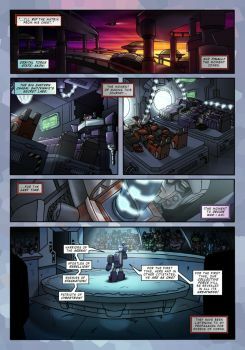 Transformers: Seeds Of Deception presents The True Identity of Rodimus Prime (an essay). 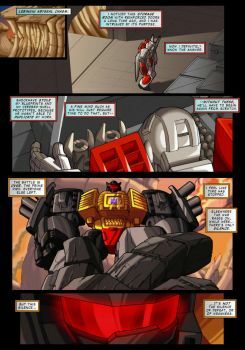 At the end of Magnificent Crisis, Rodimus Prime entered the universe of Transformers: "Seeds of Deception" comics. 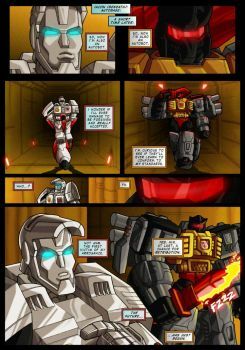 The real Rodimus Prime, the Autobot Leader invested by the Matrix. But what inspired this reimagining of the character in War Within/-Ation style? It was the original >G1 counterpart-- a figure as complex and mature as was rarely or never seen in Transformers cartoons, as this article is going to explain. Transformers: Seeds Of Deception presents Trypticon's evolution designs for The Future Is -Ation. 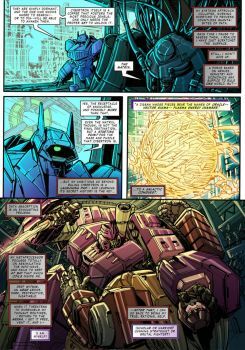 After his return in Stormbringer II, Galvatron starts enlisting Decepticon warriors for his own private army (starting with the Monstructor Six and Sixshot). 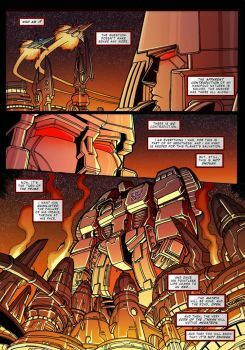 In order to salvage a certain planetary item that was stolen from Cybertron by the Quintessons, and hidden on a planet that is well known to Wheelie, Galvatron will probably have to resort to Trypticon's might... even if this means seizing the most defended Decepticon space station in the galaxy, and finding the resources to reformat it! The Transformers: Seeds Of Deception presents a character concept for the online comics of G1 Season 4: "An Italian Detour". 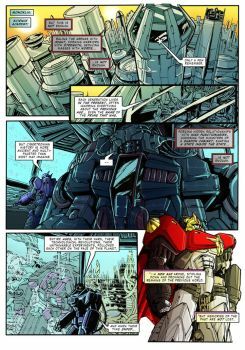 The apparently insignificant being known as Primacron was responsible of the creation of Unicron, the Cybertronian Primitives and Tornatron. How was that possible, unless his meek appearance was only a facade hiding something grander and greater? Throughout the millennia, the energy entity known as Primacron-- who had been created as an intermediary between two opposite cosmic forces-- used different avatar to interact with the physical universe. When he had to persuade the Quintessons into creating the Cybertronians, he manifested among them using the Pretender Shell featured here for the first time. Seeds Of Deception presents Differentiation (Act 2): Confrontation. The Infiltration Protocols have been reinstated! How do you divert the attention of the US Air Force from your own secret Bunker? By staging an assault on one of their bases and pretending you are a Cobra jet squadron, of course. 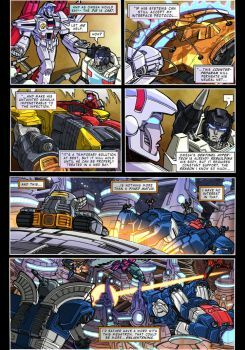 And for the first time ever, Starscream meets his maker: will the Null Ray prove enough to stop Jhiaxus' advance, as he marches on in his plan to rewrite the galaxy in Nemesis Prime's image? Art by Steve Cook, Azulg, Nikoletta Ebel. Differentiation: cover "Jee Axed Him!" 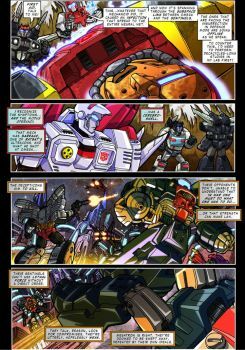 Seeds Of Deception presents the Jhiaxus/Starscream cover of Differentiation: "Jee Axed Him!" 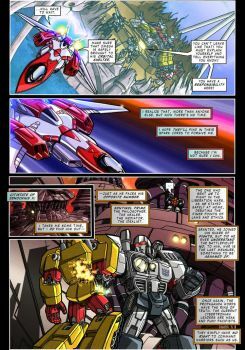 Starscream is about to meet his own maker-- in more than one sense? Transformers: Seeds Of Deception presents the cover of "The Transmogrification Occurrence". Metroplex has been invaded by the soon-to-be ActionMaster Axer! 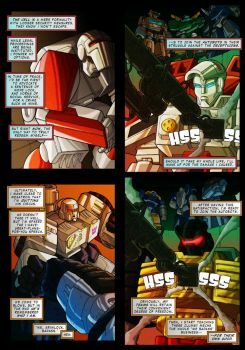 Will Scamper, Six-Gun, and Slammer (aka the MetroTeam) be able to stop him from stealing the Transmogrification Drive? It's alt-mode galore, as these Transformers reveals their never-seen-before transformations! By Todd Kinniburgh of the TCK StudiosTCK on Twitter. 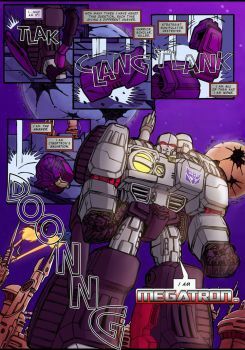 Transformers: Seeds Of Deception presents the "Emersion" bonus art for the Metroplex series. 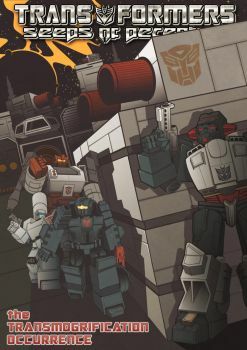 A tribute to the classic G1 Marvel Uk saga Space Pirates, this art features Metroplex emerging from the bedrock underneath Autobot City! By Joe Teanby, Chris Ludwig. Last edited by m3gr1ml0ck on Tue Apr 25, 2017 5:46 am, edited 1 time in total. 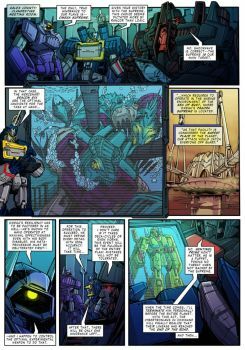 Transformers: Seeds Of Deception presents two new pages of "The Transmogrification Occurrence" (3). After invading Metroplex's spaceship form, bounty hunter Axer has managed to put the MetroTeam out of commission, and seize the Transmogrification Drive. 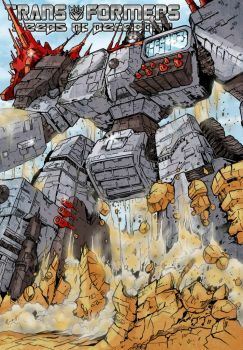 All Axer must do now is leave-- but will he survive the surprise of a Fantastic Voyage among the wonders of Metroplex's incredibly-vast structure? 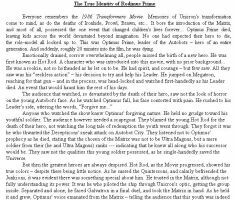 Transformers: Seeds Of Deception presents the final act of Trannis. 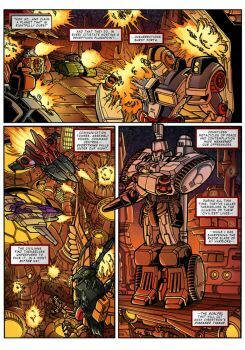 As the conspiracy weaved by the Underground Movement grows, Trannis and his allies Shockwave and Soundwave focus their effort on exterminating the leaders of the peaceful society that rules Cybertron-- Sentinel Prime and Omega Supreme! 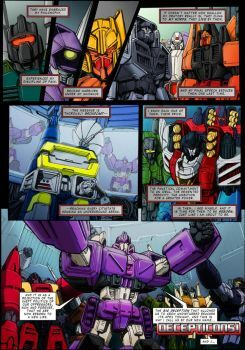 When the last moon falls, and the daylight of the Golden Age is replaced by a dark and fateful night, the Decepticons are born, and Megatron rises. The mystery of the Gladiator and Trannis is finally solved-- spelling doom for the whole planet. The Civil War has begun! By Daniele "DanBrenus" Spezzani, Nicola Perugini, Charlotte, kriegswaffle, suzidragonlady, Nasmik Allen, Lauren Mays. 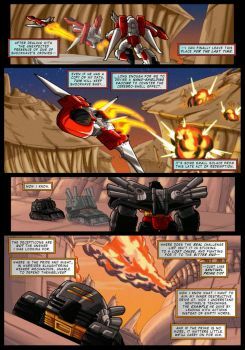 Transformers: Seeds Of Deception presents the final act of Jetfire/Grimlock. 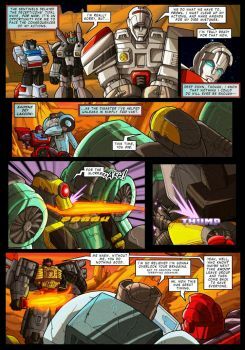 Jetfire must witness the fall of Omega Supreme, ravaged by a CerebroShell, while Grimlock stands before the honor-less slaughter of weak mechanoids-- shall they remain in the Decepticon army, or join its opposite number? And what consequences will that bring? It's the end of an era and the beginning of another one, seen through the twin eyes of the scientist and the warrior! By Daniele "DanBrenus" Spezzani, Peter Istyle, Kal, Kae Diesp.